Summertime is always filled with fun activities and experiences. During this time, however, I tend to neglect my home. 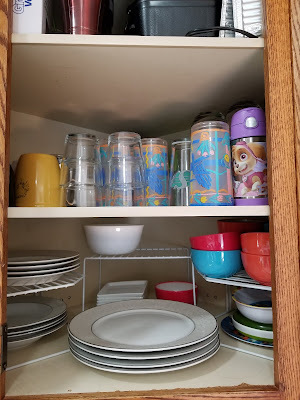 Things get shoved into the wrong cupboards, clutter (ugh) piles up and I choose to ignore it until Fall reappears. 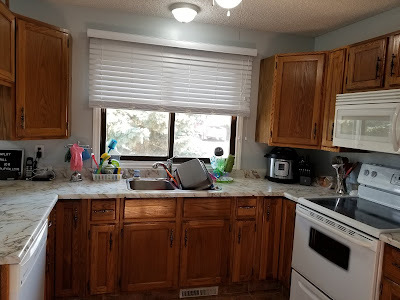 The first room on my home simplifying project was my kitchen. 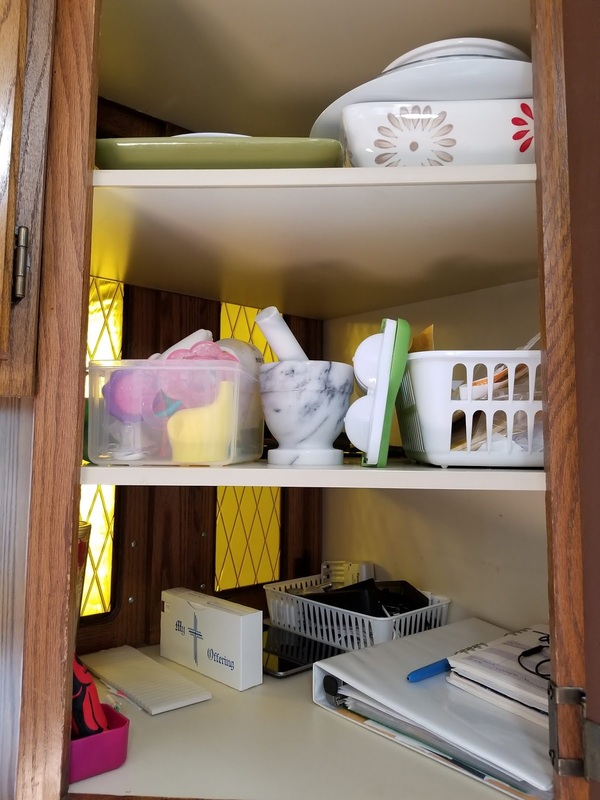 We have lived in our home for a year and a half and I have started to notice things that were not working well in the kitchen. Our kitchen is quite small and the cupboard space that it has is poorly set up. I bought some cupboard shelves from the Dollar Tree in hopes of utilizing my tiny space better. It actually worked. I didn't think to take any before pictures (oops!) so you will have to trust me when I say it was slightly chaotic. I moved all the dishes to one cupboard. It makes sense to keep like things together. I also created a 'baby' shelf for my daughter's soothers, teethers and baby food containers. I cleared a whole cupboard shelf in my kitchen to serve as a command center. I am really excited about this and hope that it helps me stay on top of things. 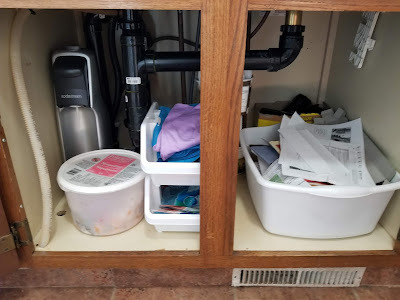 I added some stacking bins to the cupboard under the sink to utilize space and corral rags. I removed a few items that we don't use and placed them in the donation box. Paring down is always an ongoing process. Keep like things together. Our cupboards do not make this easy. 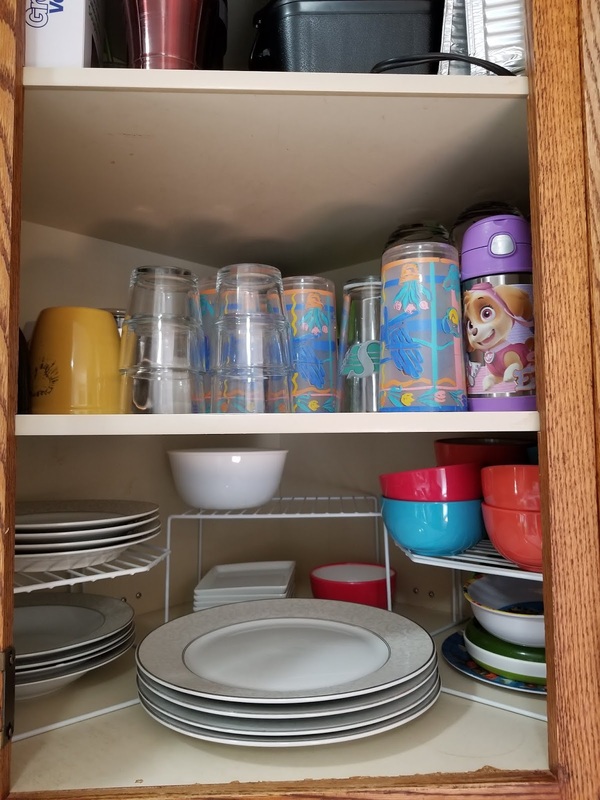 The small cupboard shelves made it possible for us to have our dishes in one place. Have a place for papers. I don't know about you, but my counter seems to attract papers and random items. I created my command center shelf in order to combat this. I want to get in the habit of dealing with papers right away so they don't pile up. Give things a home, especially small items. I use tupperware containers and stacking bins for this purpose. Small items, such as soothers and teethers need a home or they will just float around in your cupboards. If you don't give things a home they end up scattered.